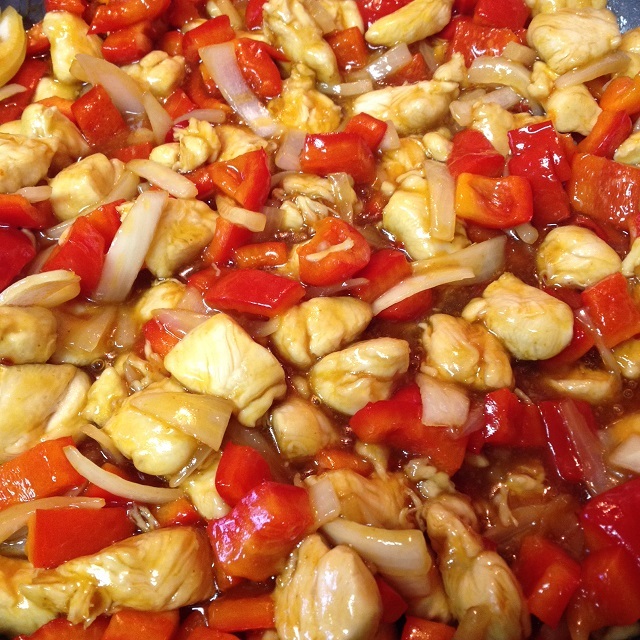 An Asian dish called Orange Chicken is actually an American Chinese dish of Hunan origin. The Orange Chicken that is served at North American fast food restaurants consists of chopped, battered, and fried chicken pieces mixed in a sweet orange-flavored chili sauce, which thickens or caramelizes to a glaze. Restaurants throughout the western hemisphere, can also refer to the dish as, “orange peel chicken”, “orange flavor chicken“, and “tangerine chicken”. In China, however, the dish is always known as “old peel chicken”, referring to dried orange or tangerine peels, which is used in traditional Chinese medicine as well as cooking. For restaurants outside of Asia, fresh orange peel is often used or no peel at all. 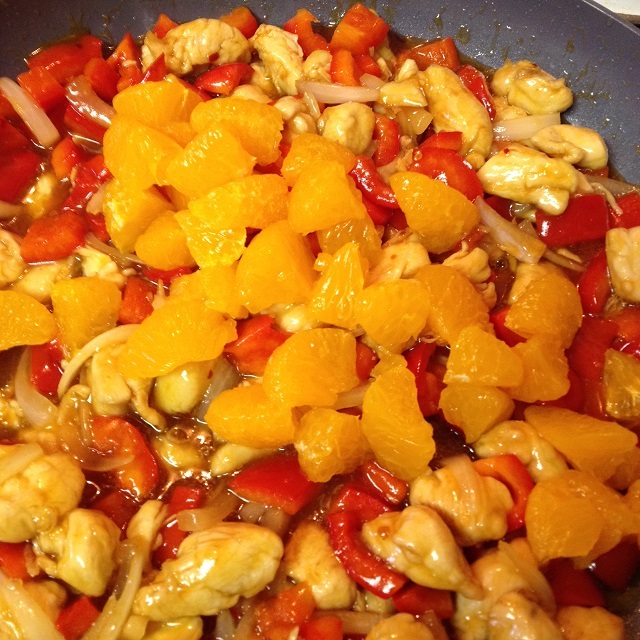 We have referred to our version as a Orange Mandarin Chicken, because we add mandarin oranges to the recipe. Here is what you will need. To make the orange sauce, combine the first seven ingredients in a small bowl. Place a medium sauce pot over medium heat and add sauce. Bring to a medium boil and add arrowroot starch and mix in, stir until sauce has thickened. Remove from heat, and set side. In a large bowl, coat arrowroot starch with chicken chunks. Heat oil in a large frying pan, and add chicken and fry for about 4 minutes or until chicken is oblique. 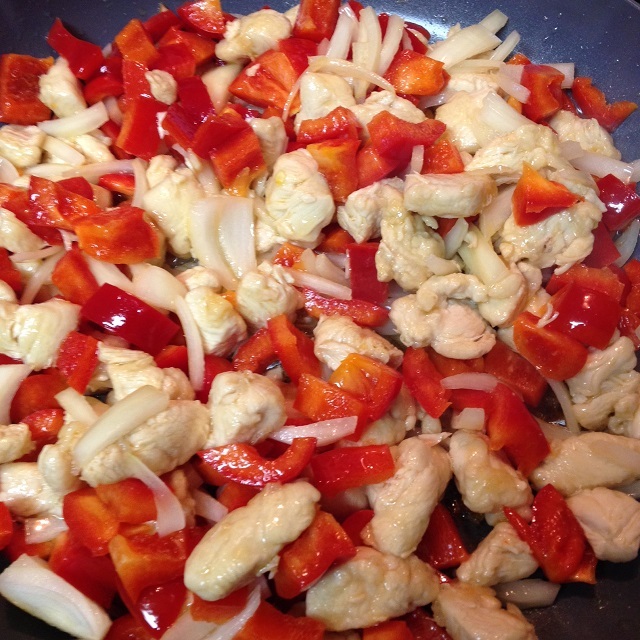 Add red pepper and onion, cut another 3 minutes, stirring continually. Add orange sauce, and stir in till will combined. Next add mandarin oranges, and stir in. Let simmer on low, about 3 minutes. 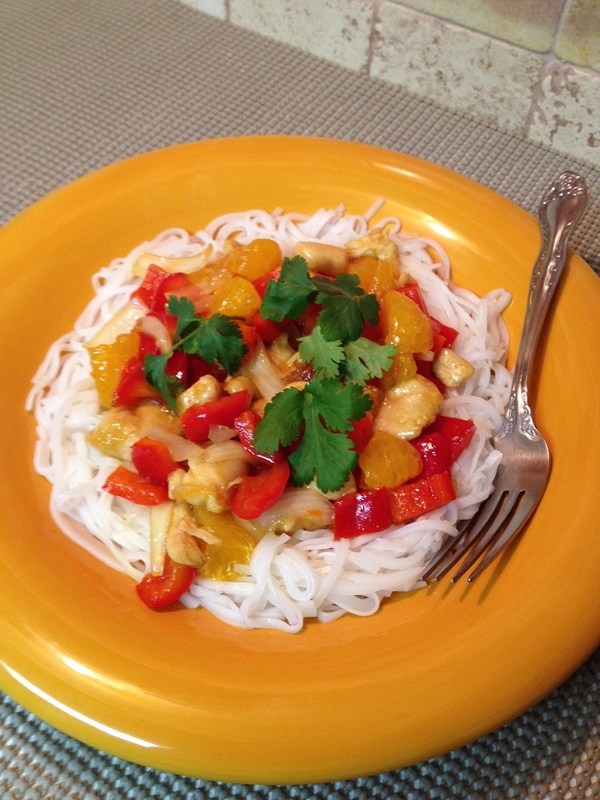 Add 1 cup cooked rice noodles to a plate, spoon on some Orange Mandarin Chicken, top with cilantro, and serve. 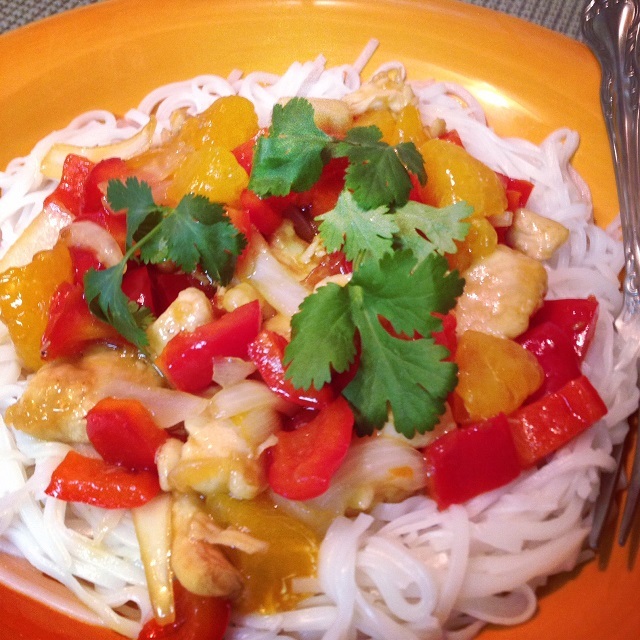 This entry was posted in Chicken, Main Dish and tagged Asian food, China, Chinese food, Cucumber, fast food restaurants, fried chicken pieces, mandarin chicken, mandarin oranges, Orange Chicken, orange peel, orange sauce, Taste, Traditional Chinese medicine. Bookmark the permalink. This is certainly a dish to brighten up a dreary winter day. Yes, and our day is very dreary here. Getting a storm from the coast tomorrow with high winds today. Thanks Jovina for syopping by and for commenting. Thanks Roger. I am glad to know I can add something positive to cloudy depressive days. It may be the color in the food. Colors do have have certain effects on our emotions. Wow this looks amazing. This looks perfect for either having a great meal at home or for taking it in lunchbox to the office. Hey thanks Luiz. I appreate that you feel that way anout this recipe. Did you chevk out our Green Curry Chicken?